Give a plain fruit basket – such as those you bring home from the grocery store – a bright new look. Acrylic paints make this patchwork make-over an easy craft project. Sand the basket to remove any splinters. Paint the inside and outside basket walls in blue (or your choice of colour). You may need several coats, depending on how absorbent the fruit basket is — just allow each coat to dry before applying the next one. You’ll find that acrylic paints dry fairly quickly. Paint the trim red and allow paint to dry completely. To add the patch design, simply paint squares or odd shapes around the outside of your basket and add black lines to the outside edge of your squares to look like stitch marks. Allow the paint to dry and finish with a coat of gloss varnish. 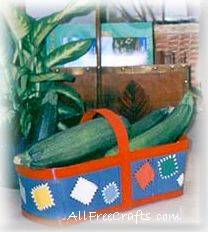 These baskets have so many uses, one being collecting zuchini, cucumbers or other vegetables from the garden. They make great carry-alls for small garden tools, cleaning supplies, tools or whatever you can fit inside of the basket.